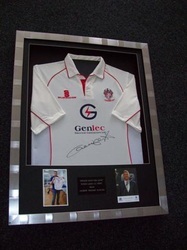 No need to worry when ordering your sports memorabilia framing from us - we make things stress and worry free. We say what we do and we do what we say. It is that simple. When you order framing from us, it is our intention to look after you before, during and after. 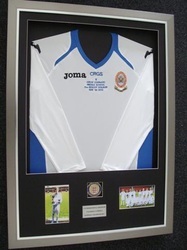 When you order your framing from Discount Football Shirt Framing you can rest assured we get everything right from the ''get go'' as we want you to return and re-order framing time after time, and also recommend us to your friends, family and work colleagues. You really are in safe hands when you purchase from us. We shall provide you with a great price via email. Simple Job Done! You are now ready to order, so simply send your items to us to be framed at The Picture Framing Centre 4 Newhouse Road Blackpool Lancashire FY4 4BY enclosing printed copy of email/ printed instruction which lets our framer instore know your framing requirements. We shall advise when we receive your items. To pay you can either enclose cheque when sending your items to us or pay cash on collection or if you prefer you may pay online via Faster Payments. Please ask about Faster Payments Online. Once you framing is completed we shall contact you to inform you, in order that you may collect from store at a time convenient to you.